The weekend before last, I had the opportunity to take a course through Storytelling Toronto. It was a great learning experience, and to my surprise I was able to successfully complete the weekend’s goal of learning and telling an oral story. I chose this story, one close to my heart as a nerd where Celtic myth is concerned. One the way home on the Saturday, I got to thinking about the tradition of storytelling. Of our mostly illiterate ancestors, sitting around fires or hearths and passing on their oral history with a dual goal of entertainment on long winter nights and establishing cultural memory. Often they did this while engaging in handicrafts that were necessary in order to food and clothe the village. This page on allfiberarts.com features a pretty decently extensive list of myths featuring fibre arts, complete with links to the myths themselves. 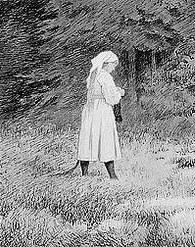 I also enjoyed this blogger’s post on the knitting Huldra character from the folklore of Norway. Speaking of the northern reaches of Europe, here is a great piece, featuring gorgeous photographs, on the traditional folk costumes of Scandinavia, which of course features lots of knitwear. They even have a book available on the subject. And of course, one can’t talk about European knitting traditions without mentioning Estonian textiles. Nancy Bush’s seminal book on the subject is something every knitter should read, in my opinion, but the essays of this blogger makes for pretty good reading as well. There is of course a rich knitting history in the British Isles too. Here are some great sites on the art of Fair Isle, Arans, and Guernseys. Heading around the world now to the Andes of Peru, no tour of knitting culture would be complete without mentioning the rich textile tradition found there. I could not find as much knit-related folklore from the area (not in English anyway), but this photographic travelogue richly illustrates the vibrant culture and mentions some folk traditions, as do the essays located here and here. The Folk Knitting Flickr group has a great bibliography of books on folk knit patterns and history on the bottom of their description page. Being a librarian of course, I have a few gems I would like to add. 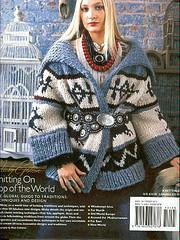 1) Folk Knits: Traditional Patterns from Around the World by Melinda Coss. It’s out of print and hard to get your hands on, but a few patterns can be found on this Flickr user‘s account, mostly on the 2nd and 3rd pages. This entry was tagged andean knitting, arans, cowichan sweater, estonian knitting, fair isle, guernseys, history, myth, nerdom, tradition. Bookmark the permalink. Awesome post! When I’m not using my phone some of those links look great! Ok, I was right, excellent links. 🙂 It always amazes me how many common elements there are in folk tales/myths, and the fiber arts are one of the biggest. Thanks! Thanks! It’s always great to hear that all the research you’ve been doing is of interest the others beyond yourself, lol. Congrats on finishing the project!